Fourth Row Center: Film Writings by Jason Bailey: On DVD: "An Education"
He's a smooth operator, this David. He's 30 years old, and Jenny is 16, but when he can pull it off, because he's charmed her parents as thoroughly as he's charmed their daughter; he doesn't stop at the "you didn't tell me you had a sister" line when he meets her mother, but he brings over good wine and regales them with stories of his worldliness and sophistication, and makes dating a woman half his age seem like its perfectly natural and downright urbane. What's more, he makes his own savoir-faire seem a shared commodity--he takes them in, and makes them part of his world. But then, that's how he gets Jenny, too. An Education is the story of their romance, and of how Jenny comes out of it stronger and, for better or worse, wiser. It is based on a memoir by British writer Lynn Barber, remembering her teen years in Twickenham, London in the early 1960s; the screenplay adaptation is by the great Nick Hornby, whose books inspired the films High Fidelity, About a Boy, and Fever Pitch. The director, Lone Scherfig, is a Dane unknown to me, though not for long; she spins Barber's memories and Hornby's script into a film of rare and fragile intelligence and grace. Jenny (Carey Mulligan) is a dedicated student, pushed hard towards an Oxford education by her father (Alfred Molina) and, to a lesser degree, her mother (Cara Seymour). Jenny's never really questioned the life ahead of her--until she meets David (Peter Sarsgaard). David drives a sportscar and knows about music and art and talks about taking her to concerts and nightclubs and even (gasp) Paris. They usually socialize with his friends Danny (Dominic Cooper) and Helen (Rosamund Pike), who seem nice enough (mostly), though they look a little weary when they first lay their eyes on Jenny. It seems that they might have been through this with David before. Sarsgaard, who remains one of our most interesting and unpredictable actors, gets David just right--he's charming and cheerful without seeming oily or creepy. But he sees all the angles and has all of his moves planned out, and when Jenny reacts understandably to a revelation about how he makes his money, his response ("Don't be bourgeois") is calculated--and effective. He's not alone, though; the picture is like a master class in acting, and there's not a bad performance in the bunch. I don't know that Molina's ever been better in a film (which is saying something), while Olivia Williams and Emma Thompson's authority figures are made admirably three-dimensional, even when they're functioning primarily as plot points. Director Scherfig gets the importance of the film's sense of ensemble; when Jenny tells her mother that her first date with David was "the best night of my life," Scherfig knows that they key to the scene isn't her saying that, but her mother's wordless reaction to it. Everything else, it would seem, is inevitable; the film is imbued with that sense of inevitability, so that even when we're hitting firmly within the conventional three-act structure, nothing feels convoluted or even terribly prepared. It unfolds with the certitude of real life. But the film lives and dies by Mulligan's work as Jenny, and it is a beautiful performance to behold. This is a tremendous actor. She's got a wonderful way of spinning a line, giving it a polish of wit and real bite, but more than that, she's a joy simply to watch--the way that she listens, and the way that you see her think before she speaks. Watch her cutaways during an early date that is not going well, or the look on her face as she sits in her first nightclub and drinks it all in; she's wonderfully expressive without ever even approaching overacting. She's so strong and interesting, in fact, that when she crumbles late in the film, it's devastating. This is a performance of tremendous dexterity and poise from an actor we'll be hearing much more from. Scherfig's direction is emotionally charged without being showy--it doesn't have to be. 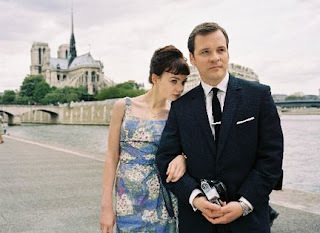 There are flashes of style here or there (the faux-French New Wave photography of the Paris sequence, a subtle push-in on Jenny during a key climactic moment), but she mostly trusts the story and trusts her actors, and for good reason. The closing scenes feel slightly rushed and there are some bothersome loose ends (particularly with regards to Danny and Helen), but those objections aside, An Education is a knowing, affectionate portrait of a man who was surely the best and worst thing that ever happened to a girl who probably should have known better. "An Education" hits DVD and Blu-ray on Tuesday, March 30. For full A/V and bonus feature details, read this review on DVD Talk.